Strategic affairs minister going to Europe in a bid to battle the continent's burgeoning BDS movement. Strategic Affairs Minister Gilad Erdan will travel to Europe in an effort to halt the success the anti-Israel boycott movement has enjoyed lately. Erdan is slated to meet with politicians, Jewish community leaders and representatives of pro-Israeli organizations. Erdan will be the keynote speaker at the largest pro-Israel conference in Europe. 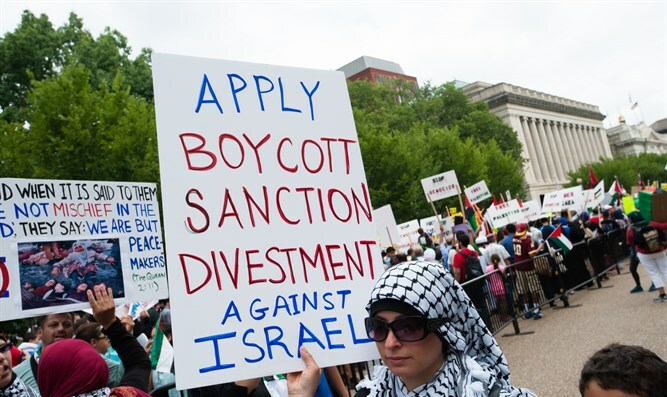 The Ministry of Strategic Affairs, which is tasked with fighting BDS activity, says that Europe is the main focus of the boycott organizations and estimates that dozens of BDS organizations are currently operating on the continent. In recent years, the European Union and individual EU member states has funded pro-BDS organizations to the tune of millions of Euros. This financing constitutes one of the main sources of funding for the movement that is working to isolate Israel in the international arena. "Europe is the center of activity of the BDS movement," Erdan said. "Many of its activists have a history of terrorist operatives, which are heavily funded by countries on the continent while promoting anti-Semitic activity aimed at blackening the State of Israel and undermining its legitimacy as a Jewish and democratic state." Israel has long protested the EU's penchant for funneling money to radical anti-Israel organizations. In 2015, Deputy Foreign Minister Tzipi Hotovely demanded during meetings with her European counterparts that they cease funding groups that work to smear Israel. Alleging that the NGOs of "work to blacken Israel’s name in the world, accuse it of ethnic cleansing, apartheid, and war crimes", Hotovely warned that if they do not remedy the matter themselves Israel will be forced to pass laws preventing the European funding.